From the BFG to the shotgun, from troublesome imps to the spectre of shareware - Doom is one of the rare titles that can be considered a true icon in gaming's brief but glorious history. The first public version of Doom was uploaded to Software Creations BBS and an FTP server at the University of Wisconsin-Madison on December 10, 1993. On this day in 1993, the general public got their first glimpse into the wonderful, scary, horrifying, twisted world created by John Romero and the legendary John Carmack. On this day in 1993, gaming took a giant leap on from its day-glo past and into a brave and graphically thrilling new world. It's all too easy to look back in time and decide what is historically important or relevant, but Doom is one of those rare beasts that would make it onto almost any well-considered list of the seminal games. Most obviously it truly popularised first person gaming. A year before Doom, Carmack, Romero and Tom Hall's Wolfenstein 3D had been a hit and introduced us to a world of first person perspective shooters - a graphical trick that had stemmed from developers finding it easier to not have a playable character on screen - but it was Doom that took the concept mainstream. That was partly down to the proliferation of PCs and the decision to make Doom's opening missions available as shareware - making it instantly accessible and building on the buzz that had already been coming to ahead across various online groups. But it also marked a new grittier, more interactive and more accessible world of gaming - a game that was designed to play on the first person perspective to generate trepidation and fear. You could hear the various monsters behind the doors that you knew you had to open, for instance, and the sheer number of traps put you on edge constantly as you played, never knowing when the lights would cut out or something would creep up behind you. Its graphics were second to none. "Its 3D visuals were stunning for the time and its ability to make you feel ultra powerful but frightened for your life was balanced perfectly, but there was more at work here than just a great game," says gaming writer Matt Hill. Let's not forget one other key factor that extended the game beyond its single player missions - this was a multiplayer-enabled game, allowing for cooperative play with up to four people and the famous 'deathmatch' (a phrase that the game coined), where you could take on your friends head to head over a local network. This was gobsmackingly exciting at the time, taking an already lauded game and allowing you to prove your skills against friends. It was the early days of multiplayer shooters - but its influence to this day can be traced through the likes of Call of Duty and Counter Strike. "It may not have been the first of its kind, but Doom is nevertheless the godfather of first-person shooter games," asserts CVG associate editor Rob Crossley. "It was an unfathomably gorgeous game, and in my view the biggest technological leap forwards in the history of the industry. "Millions played it – in fact, late in 1995, a team of Microsoft researchers discovered that Doom had been installed on more computers that year than Windows 95." The game was also set up to be customised - using accessible .wad files, the modding community could quickly and easily replace every element of the game, bringing a slew of mods that launched many careers. "It popularised concepts of competitive multiplayer and modding that are still core tenets of PC gaming today," adds Hill. "It also popularised shareware, a smart marketing concept that has been reborn in a slightly less flattering light as 'free to play' in recent times. "Doom really was before its time in pretty much every possible way." Inevitably for a game this good that you could experience for nothing, Doom proved to be an absolutely astounding hit for id Software, making stars of Carmack and Romero in the gaming world and launching a series that is still one of gaming's most recognisable worlds to this day. Some of gaming's most important titles owe a debt to Doom: we've already mentioned CoD and Counter-Strike, but let's not forget Battlefield, Half Life, Halo, Gears of War and, of course, id's Quake series. 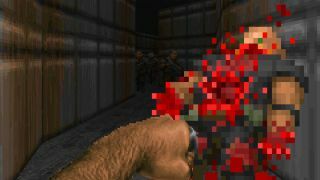 "Although id Software's own Wolfenstein 3D was arguably the original first-person shooter, its follow-up, Doom, is the seminal game," says Hill. The Doom series itself is an interesting thing to take a look at as well: Doom 2, was essentially an extension of the original with the same graphics and gameplay, but adding more powerful weapons and made available through retail rather than just shareware and mail-order. Inevitably this was incredibly successful. Master Levels and Final Doom were really just add-ons and it was a decade later that we got our next significant arrival in the shape of Doom 3, a success in terms of sales and review scores but by no means a classic. Now, id Software is a very different place with Romero long gone and Carmack's exit to head up the technology of Oculus Rift leaving any sequel without the two most identifiable men behind the success of the early series. But, regardless of what is still to come, the impact of Doom in the world of gaming is clear - it is one of the all time greats and, almost without dispute, considered to be one of the most influential titles ever. Which is more than you can say about the film tie-in with Karl Urban and The Rock. You can follow all the latest gaming news from TechRadar right here.